Imagine being sentenced to four years in prison just for stealing clamps. It's a case that will stick with Toussaint Romain for years to come, and has only gone to further his belief that, as he told me during a recent chat, "There is no justice in the criminal justice system." Romain, a public defender in Mecklenburg County who represents repeat offenders and habitual felons, was telling me about a client he represented last year named Charles. He had been caught at Lowe's shoplifting metal hand clamps. When he was searched, he was found to also be concealing a package of fish he had stolen from BI-LO. Because he was a repeat offender, he was charged with a felony in relation to the shoplifting incident, and because he had previous felonies on his record, he was stamped as a habitual felon and faced 15 years in prison. When Romain asked Charles why he was stealing when he knew his record meant he could be facing harsh punishment, his answer was heartbreaking. "He said, 'Listen, I'll tell you. I stole the clamps so that when I put a fish on my metal rod, and I put the clamps on my fish, when I turn the rod over my campfire, the fish will cook evenly. Because I'm homeless. I learned how to do this when I was in the military,'" Romain recalled. Romain contacted Veteran's Affairs and was informed that staff there had been looking for Charles for nearly 10 years. They offered their services, even telling Romain they would pick Charles up and help him find housing. But Charles wouldn't be needing housing. The local district attorney's office refused to lessen the charges against him, even after Romain approached them with what he had learned from the VA. They offered a plea deal of four years, and that's what Charles took. "Now he's serving four years in prison for stealing fish and metal clamps, when he had the VA willing to provide all of the mental health, housing and everything else that the military offers," Romain said. "That's what we're dealing with, and that's what we need to rethink." Toussaint Romain addresses a crowd of around 200 people at Warehouse 242 on Tuesday. 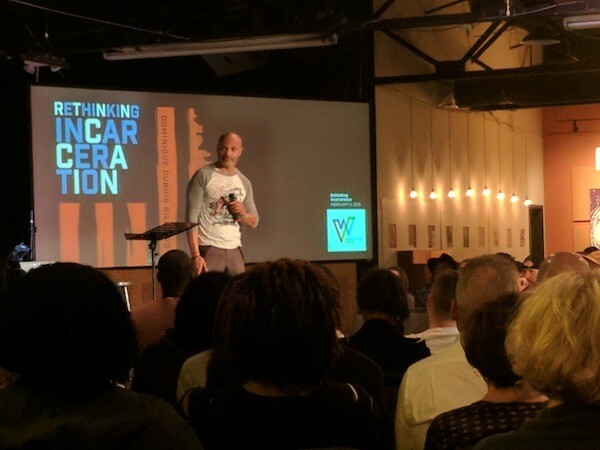 Romain was one of five speakers at "Rethinking Incarceration," an event held at Warehouse 242 on Tuesday night. It is part of Locked In Solidarity awareness and advocacy week implemented by the national Christian Community Development Association and aimed "to bring awareness and collective action to engage the systemic injustices of mass incarceration," according to a release. For Romain, who once taught a mass incarceration class at UNC Charlotte, the event was a chance to inform the ignorant, but also to create a call for action among those already in the know. "Tuesday is really an opportunity to wake more people up, to help folks become aware of the perils of our incarceration system — of what it is and what's going on there," Romain told me in the lead-up to the event. "But also, there are folks who are woke, for lack of a better word, but they just don't know what to do. So part of my effort there is to help combine our efforts so that we can all work together toward one common end. So that's what I do in general: either try to have sessions where I can help create awareness for the good folks in the room, or once they're aware, get folks together and say, 'Alright, now that we're aware, here's what we can do about it.'" Now Imagine you are back in third grade. No, really, put yourself in the mental space of the child you once were. Then imagine you come home to find out that your mother or father has been arrested, sent off to jail then eventually prison, and you weren't able to say goodbye. Think about what emotions would swell up in you following this traumatic event. What changes would have to be made to your life and how would you deal with them? Now turn to someone sitting nearby and try to express these emotions to them without speaking. That's one simulation that the staff at Center for Community Transitions held during a recent Saturday seminar in which church groups from around the county came to the CCT offices to better understand the effects of mas incarceration on the family unit. The experience is supposed to help potential volunteers understand why so many children of incarcerated parents experience behavior problems at school, which can eventually lead to a heartbreaking cycle perpetuated by the school-to-prison pipeline. Along with running a 30-bed women's work release facility and a program called LifeWorks, which offers services to anyone with any type of criminal record, CCT also runs a Families Doing Time program, which works with children in 18 area schools who have incarcerated parents. The program includes in-school support groups and monthly family nights. A new enrichment institute recently launched by CCT brings the children on field trips to help them access things they wouldn't normally have a chance to. However, even with its wide reach, CCT is only able to reach a tiny percentage of the 5,000 children in Charlotte-Mecklenburg Schools on any given day that have an incarcerated parent. Adair Hill at the Center for Community Transitions offices in the Goodwill Opportunity Campus in west Charlotte. "When someone goes to prison, they're not the only ones getting punished. You see collateral punishment to the family and the kids as well," said Adair Hill, communications director at CCT. "We see it impacting their behavior in schools, which could hurt their academic performance, which can then limit them for the rest of their lives, not to mention the emotional turmoil," Hill added. "So we really think that needs to be addressed more, because of those 5,000 kids on any given day, we serve about 400 a year, and that's all we have the capacity to serve." Hill said Charlotte's lack of economic mobility and affordable housing hits families affected by incarceration extra hard, and she was excited to see city leaders like Romain and Charlotte City Council member Braxton Winston participate in Tuesday's event. "It's a huge deal, because in the past there's been so much stigma around these issues, and we've had this legacy of tough-on-crime policies for so long that aren't working," Hill said. "Just to see people suddenly recognizing people that have been incarcerated or have a record as fellow human beings ... to finally start changing that is a huge deal," Hill said. "That's the start of any kind of change that we're going to see is people have to first be able to recognize the humanity of people that have been incarcerated." Imagine you're finally free after serving 15 years in prison. You're excited, but nervous because you don't have a home to go to or a job to report to. The prison gives you $45 in "gate money," and that's all you have to your name. After bus fare, it's not even enough to get some decent clothes for a job interview. At Promises Resource Center in east Charlotte, staff has been helping prisoners prepare for this moment by working with peer support specialists who have lived through the same experience they're currently facing. One such staff member is James Searcy, who served 17 years in prison for a drug conspiracy conviction and since 2014 has dedicated his life to helping others like him experience successful re-entry into society after serving time. 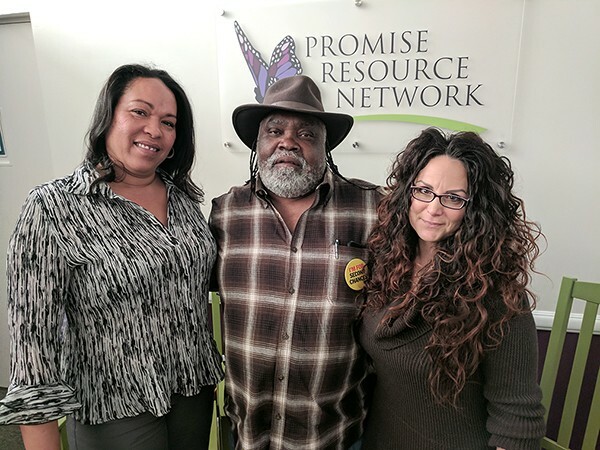 [From left] Gensie Baker, James Searcy and Cherene Caraco with Promises Resource Network. Searcy begins working with prisoners years before they're released, encouraging them to take part in job training and work release programs. He also networks with employers and property owners to help prisoners get housing or jobs with a living wage. One man Searcy recently worked with had returned to prison three times after financial issues with his family sent him back to a life of crime. This time, Searcy learned that the man had once done work with pallets in a factory, and enjoyed it. Searcy found him a job in a local factory, where he's worked since August and is now a shift supervisor. For Gensie Baker, a peer support specialist at PRN, the struggle to find meaningful work is all too familiar. Baker didn't have a peer support specialist to help her when she was fired from her job in 2012 after her employer learned of a felony she had committed in 1997, then was sentenced to probation for in 2003. Even with a college degree, she couldn't get a job making coffee at Starbucks. It took her four years to find work. "I have a college degree, I have an outstanding work history, even with those two things, I was not able to find employment anywhere in Charlotte," Baker said. "Most people who go through the system don't have a college degree. I think I'm very articulate. Upon meeting me, people said, 'Oh, you'd be great,' but then when they did the background check, it was over. 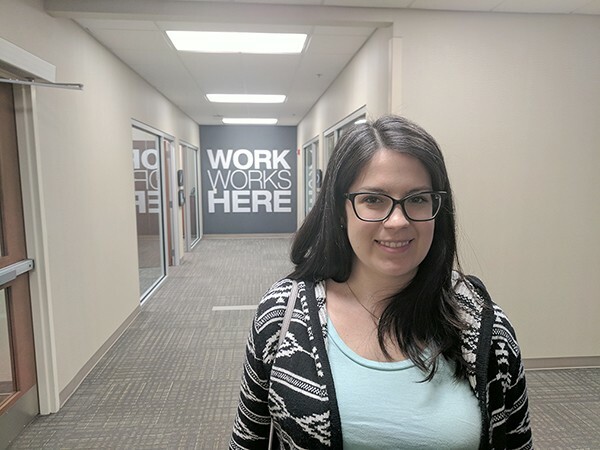 Whether looking for an apartment or looking for employment, nobody was interested." Now, PRN is finally starting to gain some recognition, as they recently signed a contract with the county's Criminal Justice Services department to begin a re-entry program that emphasizes the use of peer support specialists with lived experience. "James has been working with them for years, but finally the recognition of the legal lived experience is starting to take hold and systems are starting to ask about everything from training peers to become peer specialists while they're incarcerated to peers working in the jails and prisons," said Cherene Caraco, CEO of PRN. "I'm hoping, and what we're seeing is the role of peers in the re-entry system has the potential of becoming pretty significant in our community." Over the next year, Searcy will focus on studying failed re-entries to find out what can be done differently for each person he works with, while working on the outside to continue building his network of employers and property owners who are willing to take a chance on a former convict. "We're making progress because independent landlords are a lot more understanding than corporate places," he says. "The local property manager may be willing to do it, but when they send the application to corporate, then corporate will turn it down. 'If we rent to this person then we may lose this other population of people coming here.' So, independent landlords are more prone to work with people." As a public defender, Romain's fight may take place at the front end of the mass incarceration issue, but as a former executive member of a local coalition called Re-entry Partners of Mecklenburg, he remains passionate about all sides of the spectrum. He said that, while he's not optimistic that things will change anytime soon from a prosecutorial standpoint, he's happy to see groups come together at events like the one held Tuesday to raise awareness around an issue that is too often ignored. "I think there's a bunch of folks within our community realizing that the system just doesn't work properly," he said. "So it's good to know that we're coming together — not to say, 'Don't held people personally accountable,' but to say 'We've got to hold the system accountable.'"